One thing I know is that the American people deserve a government that draws upon the best social science available when developing social policy. In countries all over the world, legislation and policy are more rational, effective, and efficient when informed by careful social scientific data and analysis. Empirical research should be front and center in the debate about how to solve today’s challenges, from the economic crisis, immigration reform, and health care delivery to racial gaps in school outcomes and declining middle class incomes. I do believe the president’s administration realizes this. President Barack Obama has emphasized the importance of basing government policy on good science and has nominated highly respected scientists to direct the Council of Economic Advisors, U.S. Census Bureau, and Department of Energy. And yet, economists are the only social scientists with an assigned seat at the cabinet-level policy table today. In 1946 Congress created the Council of Economic Advisors (CEA) to formally consider objective scientific advice on decisions about the economy. The council institutionalized economic data-gathering and analysis as an attempt to mute ideology and partisanship in issues relating to the economic welfare of Americans. It made economic research and theory a permanent part of the U.S. policy discussion. The role of social science more generally in U.S. policy development has not been similarly institutionalized, but was influential in the middle of the 20th century. Since then, social science influence has withered in the face of a narrow emphasis on free market policy recipes and increased partisanship, which has squeezed out reasoned empirical social analysis. Without a council that institutionalizes independent social science analysis, it’s all too easy for everything but economics, and market solutions to social problems, to disappear in the midst of policy debates. The Obama administration needs a diverse group of social scientists to bring their fields’ research and evidence-based information to social policy. To that end, social scientists are calling for the creation of a Council of Social Science Advisors (CSSA) to the president. A CSSA would institutionalize science-based policy at the highest level of the executive branch. It could examine, and when necessary produce, science-based analyses and reports that help the president make informed decisions about every issue domestic and international. Some of the many prominent sociologists who support the proposal include Patricia Hill Collins at University of Maryland, Evelyn Glenn at University of California Berkeley, Arne Kalleberg at University of North Carolina, Jerry A. Jacobs at University of Pennsylvania, Mary Pattillo at Northwestern University, Donald Tomaskovic-Devey at University of Massachusetts Amherst, and Kazuo Yamaguchi at University of Chicago. While economists provide expertise on the operation of markets, solving social problems—including the crises in the economy —requires expertise on civil society, and that’s at the center of the sociological enterprise. America can’t rely exclusively on the market to remedy every problem. The “economy” isn’t simply an abstract market, it includes women and men working, earning, and spending, worrying about sending their children to college, having enough money to marry or get sick, or to care for their aging parents. The economy includes the struggle of working parents to balance their time between the workplace and their children’s needs. How to solve economic problems involves understanding people and groups as well as money, how emotional stress affects decision-making, when and how unemployed husbands become effective homemakers as opposed to deadbeat dads, and even how fear of failing effects the willingness to take the risk to marry and promise a lifetime commitment. Many other advanced industrial economies do a better job of involving diverse scientific expertise in policy development. It’s foolish for the U.S. government to ignore the expertise on comparative health care institutions in sociology and political science, or to rely only on the narrow cost-benefit approach of health care economics and the partisan appeals of vested interests. The same is true for policy involving crime, immigration, family, energy, and education policy. Sociologists, psychologists, historians, criminologists, and social workers can help us understand and build strong communities and neighborhoods. One other thing I know is that the United States produces some of the best social scientists in the world. It’s time for us, and our responsibility, to bring that expertise to the policy table. 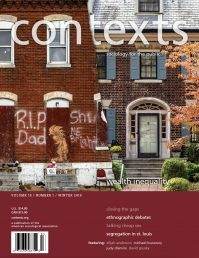 Listen to an interview with Barbara Risman on the Contexts Podcast about the push for a Council of Social Science Advisors. Inside Higher Ed reports from the American Sociological Association meetings in San Francisco on the discussion surrounding a Council of Social Science Advisors and sociology’s place in the public sphere. Barbara J. Risman is in the sociology department at University of Illinois at Chicago. She is also executive officer of the Council on Contemporary Families.